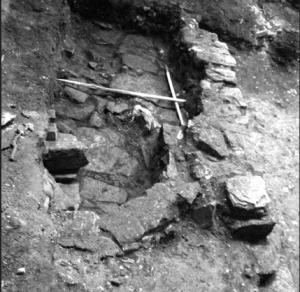 Excavations at 119-125 Marygate, Berwick-upon-Tweed (the former Paxton and Purves drapers and tailors shop) in 2007 have revealed a sequence of activity from the 13th century through to the present day and recovered a large assemblage of archaeological material, including ceramics, animal bone and carbonised macroplant remains. Levelling of the ground at the front of the building in the 19th century had removed all evidence for structures relating to the medieval street frontage but early activity was preserved towards the rear of the plot where midden deposits had been dumped and possibly used to level the slope down towards the river Tweed. Sometime in the 13th century three oven-like structures, which are thought to be corn driers, were constructed on the plot. Large amounts of charred oat grains found in a pit and other deposits suggest grain processing on a semi-industrial scale. Pottery found in the demolition debris in and over the ovens suggests that this activity had ceased by the mid 14th century, possibly due to the Border conflicts and the reduced size of the population. For the next few centuries the rear of the plot was used only for agricultural or horticultural purposes, evidenced by the dumping of midden material and the build up of a garden soil. This reflects the situation illustrated on a map of 1570 on which it is possible to approximately locate the site. This shows a row of buildings fronting on to Marygate with enclosed gardens or yards behind. During the 16th century the building on the street frontage begins to expand back into the yard or garden, with the construction of a building containing a cobbled surface and stone lined gully, possibly a stable. The rear half of the plot continues in use as a garden. A series of wide, shallow ditch-like features had been cut in parallel to each other into the garden soil. These are very similar to features that can be seen on the 1570 map, although not within the properties surrounding the excavation area, and it seems most likely that they relate to horticultural or agricultural activity. They may have been created by the cultivation of crops such as raspberries with the depressions caused by walking between the rows of canes. Development over the rear of the plot continued throughout the 18th and 19th centuries, presumably reflecting the growing prosperity of the owners and the town itself. There are three successive expansions of the building’s footprint out into the back land and onto the remaining area of garden, culminating in the standing building that we see today. One interesting development was the construction of what appears to be an early septic tank. This took the form of a large stone-built subterranean chamber with niches in its walls, which had subsequently been split in two by the construction of a brick wall and capped with a sprung brick roof. It is possible that this feature originally began life as a cess pit which was later modified by the addition of the brick wall to form two connected chambers, the primary requisite of a septic tank. The structure reflects improvement in civic hygiene and suggests that Berwick may have been ahead of its time. Septic tanks were first patented in France by John Louis Mouras in 1881 and first introduced to England after 1895. However, pottery dating from the late 18th to the mid 19th century, which can only have been deposited after the conversion of the tank, highlights the possibility that primitive septic tanks were in use in England from a much earlier date and that Mouras was only developing an already established sewage treatment system. The excavations have revealed evidence for the development of the site from at least the 13th century through to the 19th century, developments which reflect in microcosm those of the town itself, from establishment and consolidation during the 13th and 14th centuries, stagnation during the Border wars, expansion as security returns to the town following the English conquest in the 16th century, and finally increasing prosperity throughout the 18th and 19th centuries. The archaeological work was undertaken by AOC Archaeology Group and funded by Bowcliff LLP to a written specification agreed with Northumberland Conservation. 1. One of the 14th century ovens.